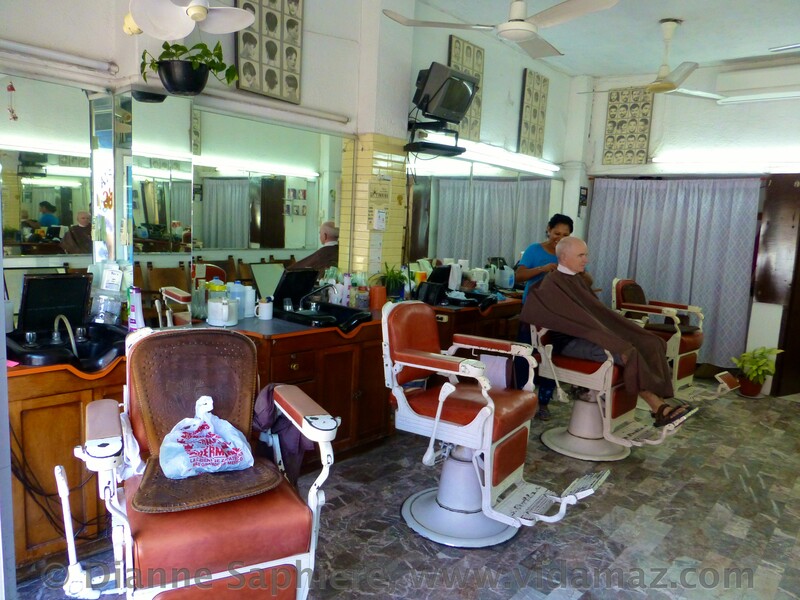 Greg’s Beloved Barbershop | ¡VidaMaz! I often give him a hard time, that he’s going to meet his girlfriend. She does tell him, after all, repeatedly and with lots of gushing, that she loves him. Of course, she tells me she loves me, too. How many barbers love you? I expect it’s quite a common expression of emotion here in Mazatlán, fortunately for all of us who live here. Greg learned about his favorite place from his buddy Scott, who we miss mightily. What does he love about going to this barbershop? Delia, of course. She always has a huge smile, lots of hugs and kisses, and a desire to catch up on the few weeks of life since she’s last seen you. And she ends each of her haircuts with a motorized handheld massager! What’s not to love? Greg also, I know, loves the ambience of the place: the antique barber chairs, the handmade wooden chairs from Concordia that comprise the waiting area, the retro haircut drawings to provide you ideas, and, of course, the prices. We even enjoy the owner, María Inéz, who lives near us and makes some killer tamales. If you enjoy good old-fashioned barbering, a close shave, or a cut that ends with a relaxing massage, do visit your nearby barbershop row. It beats the mall anytime. At least for some. That’s Bill’s favorite too!!!! And Delia is his “barber” too!!! She is great!!!! What a small town we live in, Cathy! We will hug her for Bill next time we’re there!